(Steve Griffin | The Salt Lake Tribune) Sen. Dan Hemmert, R-Orem wears a yellow rose on his lapel showing his support of SJR1, a concurrent resolution initiating the replacement of the state's statue of Philo Farnsworth in the United States Capitol with a statue of Dr. Martha Hughes Cannon, as the joint resolution was discussed in the Senate Chamber in the State Capitol in Salt Lake City Monday January 29, 2018. (Steve Griffin | The Salt Lake Tribune) A video of about Dr. Martha Hughes Cannon, pictured, plays on television screens as Senators discuss SJR1, a concurrent resolution initiating the replacement of the state's statue of Philo Farnsworth in the United States Capitol with a statue of Dr. Martha Hughes Cannon, in the Senate Chamber at the State Capitol in Salt Lake City Monday January 29, 2018. (Steve Griffin | The Salt Lake Tribune) Senators wear yellow roses in support of SJR1, a concurrent resolution initiating the replacement of the state's statue of Philo Farnsworth in the United States Capitol with a statue of Dr. Martha Hughes Cannon, during discussion of the joint resolution being discussed in the Senate Chamber in the State Capitol in Salt Lake City Monday January 29, 2018. (Steve Griffin | The Salt Lake Tribune) Senators wear yellow roses in support of SJR1, a concurrent resolution initiating the replacement of the state's statue of Philo Farnsworth in the United States Capitol with a statue of Dr. Martha Hughes Cannon, during discussion of the joint resolution being discussed in the Senate Chamber in the State Capitol in Salt Lake City Monday January 29, 2018. (Steve Griffin | The Salt Lake Tribune) Sen. Dan Hemmert, R-Orem pins a yellow rose on his lapel showing his support of SJR1, a concurrent resolution initiating the replacement of the state's statue of Philo Farnsworth in the United States Capitol with a statue of Dr. Martha Hughes Cannon, prior to the joint resolution being discussed in the Senate Chamber in the State Capitol in Salt Lake City Monday January 29, 2018. (Steve Griffin | The Salt Lake Tribune) Sen. Todd Weiler R-Woods Cross and Sen. Deidre M. Henderson R-Salt Lake, fist bump as SJR1, a concurrent resolution initiating the replacement of the state's statue of Philo Farnsworth in the United States Capitol with a statue of Dr. Martha Hughes Cannon, passes out of the Senate and heads to the House, following discussion in the Senate Chamber in the State Capitol in Salt Lake City Monday January 29, 2018. (Steve Griffin | The Salt Lake Tribune) Statue of Dr. Martha Hughes Cannon at the Utah State Capitol. SJR1, a concurrent resolution initiating the replacement of the state's statue of Philo Farnsworth in the United States Capitol with a statue of Dr. Martha Hughes Cannon, passes out of the Senate and heads to the House, following discussion in the Senate Chamber in the State Capitol in Salt Lake City Monday January 29, 2018. (Steve Griffin | The Salt Lake Tribune) Statue of Dr. Martha Hughes Cannon at the Utah State Capitol. SJR1, a concurrent resolution initiating the replacement of the state's statue of Philo Farnsworth in the United States Capitol with a statue of Dr. Martha Hughes Cannon, passes out of the Senate and heads to the House, following discussion in the Senate Chamber in the State Capitol in Salt Lake City Monday January 29, 2018. (Steve Griffin | The Salt Lake Tribune) Statue of Philo Farnsworth in the Utah State Capitol. SJR1, a concurrent resolution initiating the replacement of the state's statue of Farnsworth in the United States Capitol with a statue of Dr. Martha Hughes Cannon, passes out of the Senate and heads to the House, following discussion in the Senate Chamber in the State Capitol in Salt Lake City Monday January 29, 2018. (Steve Griffin | The Salt Lake Tribune) Statue of Philo Farnsworth in the Utah State Capitol. SJR1, a concurrent resolution initiating the replacement of the state's statue of Farnsworth in the United States Capitol with a statue of Dr. Martha Hughes Cannon, passes out of the Senate and heads to the House, following discussion in the Senate Chamber in the State Capitol in Salt Lake City Monday January 29, 2018. The Utah Senate voted 21-7 Monday to advance a bill that would replace a statue of TV inventor Philo T. Farnsworth in Washington, D.C., with that of Martha Hughes Cannon, the first woman state senator in Utah and the country. Supporters of the switch portrayed it as a way to both honor the past and acknowledge the present. Many senators wore yellow roses, which once signified support for the women’s suffrage movement, as they alluded to the current cultural reckoning around women’s role in politics and beyond. This was a nod to Cannon’s part in helping Utah women gain the right to vote more than 40 years before Congress passed the 19th Amendment. Cannon was a Mormon pioneer, a polygamous wife and suffragette who earned a medical degree from the University of Michigan and defeated her own husband when she won her state Senate seat in 1896. Sen. Todd Weiler, R-Woods Cross, the bill’s sponsor, said after the vote that those who voted against the measure were defending Farnsworth and not denigrating Martha Hughes Cannon, women or women’s rights. “We have a world class leader that’s already there, so it’s difficult for some people to remove [Farnsworth] because they feel like somehow we’re demoting him,” Weiler said, though he predicted the legislation will pass the House. Weiler’s bill would swap Farnsworth’s statue with Cannon’s, which now sits outside the Utah state Capitol. But some senators spoke in favor of keeping Farnsworth, who was born in Beaver, Utah, and attended Brigham Young University, in his place in D.C. His statue has been on display there since 1990. Farnsworth created a number of inventions, and his corporation at one time held more than 150 patents. However, he is best known for the technology that made television possible. “[Farnsworth] was born and buried in Utah, and he not only benefited the people in the state, he benefited the people in the world,” said Sen. Margaret Dayton, R-Orem, during debate. Dayton noted that Utah’s Legislature had already voted to determine its representatives in the National Statuary Hall Collection in the U.S. Capitol, where two figures of historical significance represent each state. This was one reason she said she would not be supporting the change. At the time the Legislature in 1987 selected Farnsworth to join the statue of Mormon leader Brigham Young, Utah was one of six states that had only one statute in D.C.
Ridgecrest Elementary School principal Bruce Barnson was the mastermind behind the lobbying effort that secured Farnsworth’s place there. His students conducted research to determine which historical figures would best represent Utah in the nation’s capital, studying 21 prominent Utahns and surveying 400 residents across the state before settling on Farnsworth. Treva Barnson, Bruce’s wife said after the vote the couple was “very, very sad” that the measure had passed, but hopeful it would fail in the House. The resolution now moves on to the House for consideration. 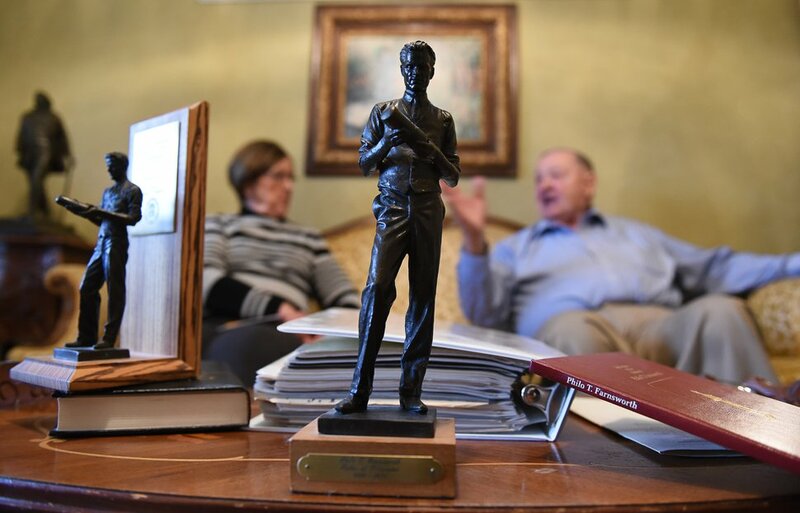 (Francisco Kjolseth | The Salt Lake Tribune) A small replica of the statue of American inventor and television pioneer Philo T. Farnsworth has come to the forefront once again for Draper residents Treva and Bruce Barnson. Bruce, the former principal of Ridgecrest Elementary who lobbied the Legislature back in the late 80s to bring the larger than life statue to Statuary Hall in Washington D.C., is making the argument to keep it where it is after hearing the news that Sen. Todd Weiler has introduced a bill for January's legislative session to replace Farnsworth's statue with Martha Hughes Cannon, the first woman state senator.